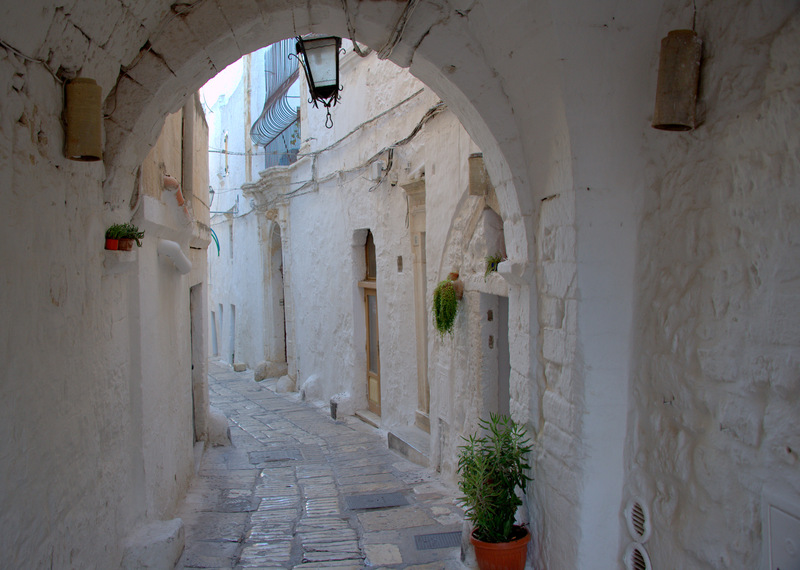 The gorgeous Ostuni laneways and arches in the old town. Last time (also the first time) I came to Puglia, my goal was to find an area where I thought I’d like to buy an apartment. After a lightening visit to towns in both the north and south of this beautiful part of southern Italy, I decided the north was the place for me. And after an even quicker visit to Ostuni for a couple of hours, I decided I liked it enough to book myself a longer stay a few months down the track. This time the goal would be to contact real estate agents and actually see some properties. So let’s begin with some history. Ostuni is a small but beautiful hilltop town in the Brindisi provence of Puglia. Apparently it was smashed to bits by Hannibal during the Punic Wars and then rebuilt by the Greeks, which may come as no surprise if you’ve looked at my picture above. 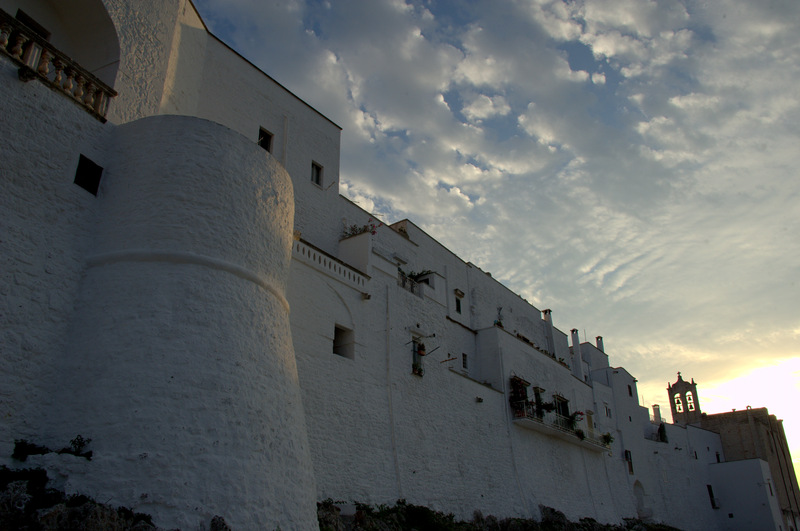 In fact the word Ostuni comes from the Greek ‘Astu neon’ – New Town. 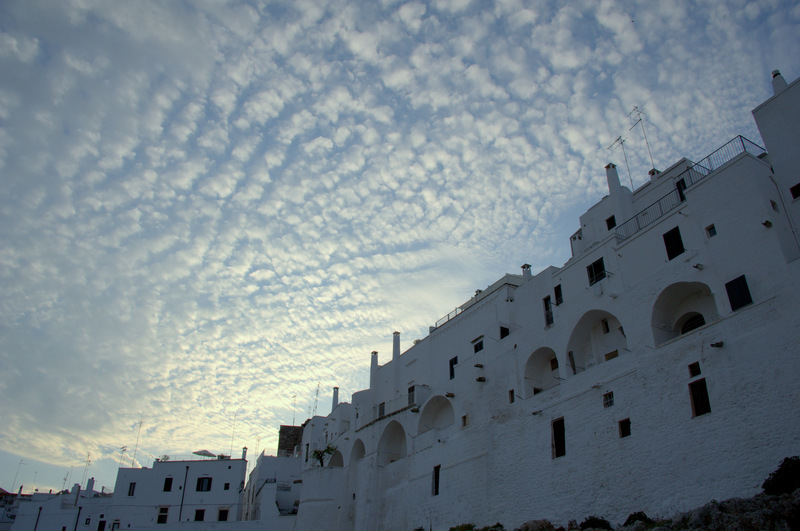 But more on Ostuni later. Another goal for this trip was to simply spend time ‘living’ in Ostuni. After all, visiting somewhere as a tourist is totally different to living there permanently, right? London’s the perfect example of that for me. Amazing city for to visit, not so amazing when you live there. Unless of course, I imagine, you’re lucky enough to be loaded. And yeah, I know nine days is hardly enough to make that kind of determination, but it’s long enough for me to get a pretty good vibe, and I’m all about listening to my gut. Although I’m not in a super rush, I’m mindful of working to some kind of timescale. So I’ve given myself twelve months, and at this stage I’m already four months in. As gorgeous as it is, the idea of living in the old town doesn’t appeal. Too many bloody tourists like me wandering around taking photos all day. Continuing my “I don’t really know what I’m doing” and “I’ll make it up as I go along” modus-operandi, I decided to just do what I would do if I were buying an apartment in the UK, or even at home in Australia. So I went on a website a week before I got here, found some places I liked the look of and sent an email to the agents asking if it was possible to see them the following week. I used Casa.It, a website where a whole lot of different agents advertise their properties. If you’re in Australia, it’s just like Real Estate.com.au or Zoopla or Rightmove in the UK. I told myself all I needed at this stage was to see a few properties and try to grasp what the market was like, what kind of places were available in my budget and what I could get if I had more money… because you know… maybe I’ll win the lotto between now and next year. It’s totally possible… if I start buying lotto tickets. I had also primed myself for disappointment, something I might continue to do with this project since it seems to be working so well. I did this because I don’t think I’ve ever read a single good thing about Italian real estate agents – “they’re crooks”, “they hike the price up for foreign buyers”, “they never answer emails”, “they’re not very helpful” and so on. So I lowered my expectations. In fact I lowered them so much, if they were a product, not only would you find them at the pound shop (that’d be the $2 shop for you Aussies), you’d find them in the bargain bin in the pound shop. Now I don’t know if it’s because Ostuni is basically a seaside town, so things are a bit more friendly and relaxed than a big Italian city, or maybe there’s so many places for sale, real estate agents have to be nice to foreigners to make a living, or maybe even because its not summer and they have the time to be more helpful, but for me it was that simple; look at a website, send some emails, make some appointments. Easy peasy lemon sqeazy. It’s astounding how ridiculously colourful everything is in Ostuni. But hang on, I know this is only the beginning, I’m not ready to pronounce the stereotype attached to real estate agents in Italy is a total load of kaka just yet. But I can say, having just dipped my toes in the water, I saw no evidence of sharks… yet. I did see a hint of the difficulties people might be talking about when buying property in Italy though. Mostly it was simple. All three agents I emailed on Casa.It emailed me back. The first one got me in to see five properties one day and three the next, one of these was because the property was rented out and the tenants weren’t leaving till the next morning, But that was fine because it wasn’t the one I’d enquired about. This particular agent was just happy to show me lots of places after I explained I wanted to see a variety of what’s available in Ostuni. The second one was where the problem occurred. We had an appointment for 12.30pm to see an apartment. When we turned up we were told to come back at 5pm because there were renters in there. No big deal as I didn’t have any other plans that day, but kind of a waste of time since we’d made an appointment and presumably the owner would have had to OK that. But when we returned at 5pm nobody answered the door, and after ringing the owner, the agent told me he was in another town and didn’t want us to go in there without him. Erm, yeah, slightly annoying. But not really the agent’s fault. His time was wasted as well. The third agent showed me the last apartment I was interested in, but although it was nice, it was too sterile for me, too cookie cutter perfect. But by that stage I had all the info I thought I needed so wasn’t really fussed about seeing any more properties, and he didn’t push me to see more either. So in three days I had seen nine properties, got a good idea of the typical houses in Ostuni, decided I really liked the typical houses in Ostuni, saw that they were well within my budget and even saw a couple of places out of my budget to get some ideas (all photographed for future reference) of what I could do with a property if I bought one that needed refurbishment. The rest of the week I’ve just been sitting in the sun on my roof terrace reading, eating way too much salami and cheese and drinking too much Limoncello. Seriously though, with all the stairs in these houses, Limonecello’s not the best idea to pass the time on the roof. The paranoid part of me is wondering why it was all so easy, but the rest of me is quietly confident that trip three will be equally as successful. In fact the only spanner in my future works is the fault of the UK, not Italy. As soon as I get back to Edinburgh, I have to hand in my passport so they can process my UK residency. And those processing times, which you may have read me moaning about in The Bum Diaries, are three to six months. Worse case scenario, I can’t come back for Puglia Trip #3 till April 2014. Oi vey! So, over the next few weeks I’ll post a bit more about Ostuni and my time here, but it will be a long while yet before I can tell anyone about the scary part of buying property in Italy; the actual buying part. Ah well, we’re not in a hurry. Are we? Very interesting and all the best of luck to you on your Puglia adventure. We moved to Puglia from the US earlier this year and couldn’t be happier. If you want some of the background, you can check out my blog at http://www.souloftheheel.com. (By the way, Ostuni is in Brindisi, not Bari.). Again, best of luck. Woopsie, thanks for the correction Scott 🙂 And cool, always love a new blog to check out. I will indeed have a read. Reblogged this on Latest Trends,News,Buy,Sell-European Real Estate. Your welcome Natalie Chatalie, Actually your blog is awesome, I love it.